Wat Traimit in Bangkok is situated nearby Haulampong Railway station at the end of the Chinatown's Yaowarat Road. A gigantic gold seated Buddha is positioned inside Wat Traimit. It is estimated to be nearly five meters in height with a weight of around five and a half tons. In the historical times, different craftsperson designed the Buddha using gold and in order to shield it from the overrunning armies, they covered it thoroughly with stucco as well as plaster. The history of this image got a flamboyant past. A free of cost leaflet is circulated once you have paid for your entry. The Golden Buddha was placed around the 13th century, undeniably it is an outstanding illustration of the tactful Sukhothai elegance, and it looks elegant even in the current times. In order to safeguard it from the hooligans and thugs, it was entirely fabricated in the plaster & lacquer. It was camouflaged so aptly that it became impossible for people to guess what was hidden underneath. There was a temple near the location where Oriental Hotel is situated these days, once upon a time a member of King Rama III's court relocated the statue to Bangkok and installed. However, that temple was thoroughly neglected and was entirely abandoned during the year 1931. Until it was relocated to its existing site at Wat Traimit in 1955, the true profile of Golden Buddha wasn't exposed. When the image was being erected in its new place, incidentally the ropes got damaged thereby tumbling the statue. This episode caused the plaster to chip off, thereby exposing the gold interior. Tads of the plaster are being exhibited in the in the interpretive point which is situated beneath the chapel. This statue is currently situated in a chapel which was recently inaugurated in the year 2010. This is hanging high over a four-storeyed ziggurat enclosed in marble. The second as well the third floors are categorically used as an informative focal point. Moreover, the second floor displays the rich history of the Chinese community, particularly in Bangkok. A 3D presentation is used to commence it and eventually moves on to scenes related to different Chinese merchants in the past. Similarly, the third floor of this structure is dedicated to elaborating the past of the Golden Buddha image. There is a display of a unique video at the commencement of the show, this exclusive audiovisual walks its audience through a quick history on the Buddha images moreover it gives a detailed story of the "subduing Mara" which is a posture for this particular image. If a visitor wishes to see the Golden Buddha, they are supposed to pay 40 Baht which is around 1.04 USD. The overall visit to the museum costs an extra 100 Baht about 2.60 USD. The temple opens from 8:00 am and closes at around 5:00 pm every day. However, the museum doesn't open on Mondays. Wat Traimit is known to be an operative and active Thai Buddhist temple. The administration of this temple commands the visitors to dress up in a humble fashion. According to these rules, men are instructed to wear full-length pants along either a short-sleeved or any long-sleeved shirts. However sleeveless shirts and tank tops are strictly prohibited. The administration instructs the women to dress up in knee-length skirts or pants and revealing clothes shall be strictly avoided. Wat Traimit is situated near Odeon traffic circle. 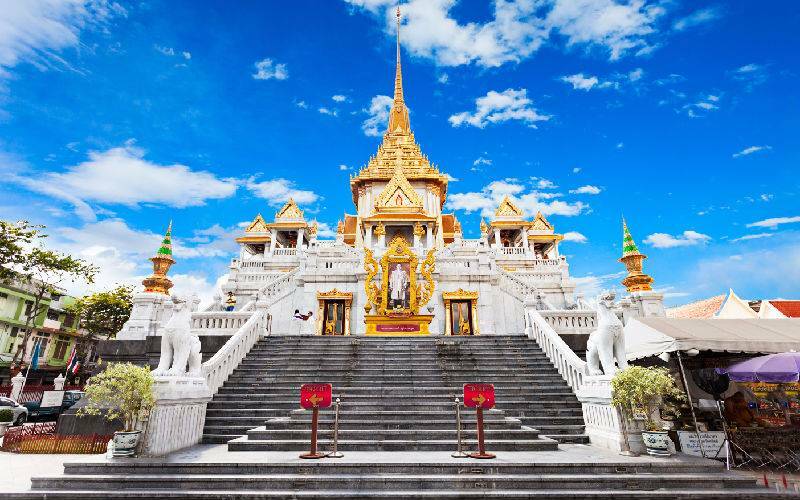 Wat Traimit is led by a giant symbolic Chinese gate which showcases the entry to Bangkok's Chinatown. 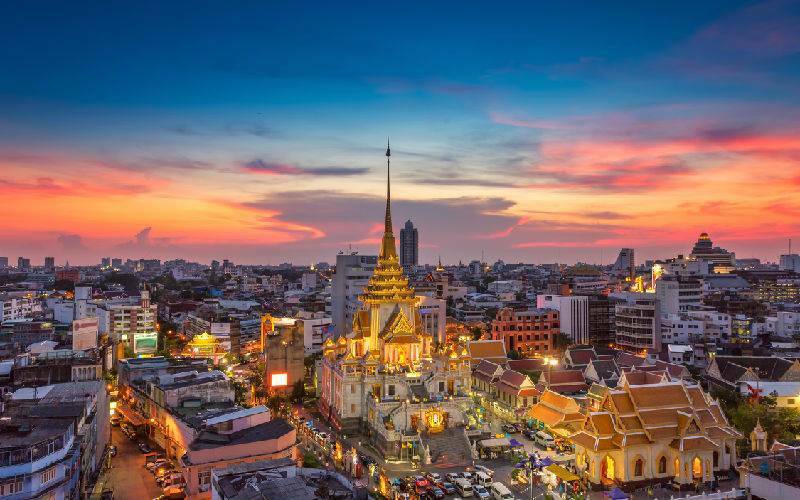 As a matter of fact, it marks as either an exceptional start or a conclusion, to a detailed Chinatown tour, the tour that usually embarks from Ratchawong Pier which is Chaophraya River Express Boat service. The shrine is situated at a fairly short distance from Hualamphong railway station. There are a number of food courts as well as an easy transportation entree. Furthermore, it is a fairly stress-free walk from the subway station at Hualamphong.